In January the US Treasury will auction off the first set ($10-15bn) of floating rate notes (FRNs). These are two-year notes with quarterly payments based on the 3-month treasury bill rate plus (or minus) some small spread. The notes will be auctioned off at par, with the premium/discount built into the spread (see term sheet below). It has been some 17 years since the US Treasury has introduced a new product. The demand for "floaters" has been strong as fixed income investors grapple with rising rates. The rally in senior leveraged loans for example (see post) has been driven to a large extent by the fact that the coupon on these products rises as rates increase. And now the Treasury will attempt to take advantage of this demand. 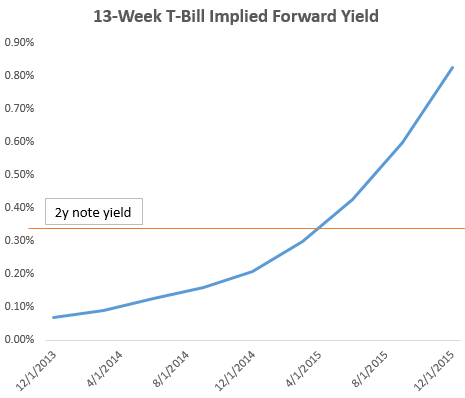 The 3-month treasury bill rate is currently around 7bp vs. the 2-year note yielding about 34bp. So why would someone accept such a low rate on a 2-year product when they can lock in a higher rate with a fixed rate note? 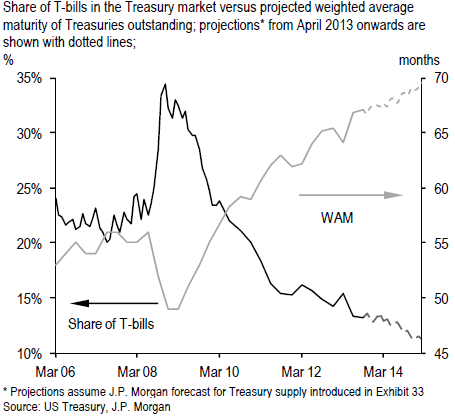 The reason is that the market expects the 3-month bill rate to rise quite sharply in the next couple of years. Therefore while the expectation is that the FRN buyer will make much less at the beginning, at some point the coupon will rise above the current 2-year note rate to compensate investors for the lower initial yield. Ultimately (in an "arbitrage-free" world), the expected effective yield on a 2-year FRN and a 2-year fixed-rate note issued by the US Treasury should be roughly the same. Who will buy these products? The biggest demand will come from money market investors - those who currently buy bills. Because the FRNs are equivalent to "rolling" a three-month bill, rated money market mutual funds now have permission from the rating agencies to buy the notes. S&P released a statement recently saying that the "new U.S. Treasury Floating-Rate Notes are consistent with our principal stability fund ratings criteria". There is some concern however that this FRN program will reduce the amount of treasury bills available in the market, particularly as the Treasury attempts to lengthen the average maturity of total debt outstanding. JPMorgan: - Going forward, we expect Treasury to err on the side of caution, and our forecast assumes $10bn in monthly FRN issuance until the program is more developed. Furthermore, our issuance forecast shows FRNs as a substitute for Treasury bill issuance, consistent with the goal of lengthening the weighted-average maturity (WAM) of the Treasury debt. As discussed back in July (see post), treasury bills as a percentage of total government debt have been on a decline for some time, and the new FRNs are expected to further reduce this supply.